Assessing how our guesses of how Sunday's game could turn out did indeed turn out, and passing on a few observations along the way. In a new feature this season, each day following a Seahawks game I’m going to review what I judged ahead of time as my keys to the game and assess how they turned out, as well as examine what I may have overlooked. WHAT I SAID: Seahawks RT Germain Ifedi vs. Denver OLB Von Miller. WHAT HAPPENED: This indeed was a matchup to watch as Miller dominated the Seattle front with three of Denver’s six sacks as well as a forced fumble and just general havoc-making throughout. But not all of that was strictly Ifedi getting beaten one-on-one. On Miller’s second sack of the game — a third down play in the second quarter — Miller lined up over tight end Will Dissly, who went out for a pass, leaving Miller an unimpeded path to Russell Wilson while Ifedi was helping J.R. Sweezy block Derek Wolfe. It was either simply a scheme that beat Seattle or miscommunication — and maybe Ifedi could be to blame for that. That’s the kind of thing that’s hard to know for sure from the outside. On his weekly radio show on ESPN710 Seattle Monday, coach Pete Carroll said he thought Ifedi held up well enough, considering the opposition. So don’t count on any change at that spot anytime soon. Pro Football Focus judged that Ifedi allowed just two pressures on 42 pass-blocking snaps and rated him 39th of the 62 offensive tackles to play so far in week one. WHAT I ALSO COULD HAVE SAID: Denver receivers vs. Seahawks cornerback Tre Flowers. It wasn’t evident until late in the week that Flowers would start at right cornerback in his first NFL game, with Dontae Johnson going on Injured Reserve. Once he was announced as a starter, it was evident the Broncos would test him early and often — and they did, throwing his way on the first play, an incomplete pass. Carroll said later he thought Flowers held up well and noted only one big pass he thought was his specific responsibility: a 31-yard completion to Emmanuel Sanders in the second quarter. Flowers also gave up receptions of eight and seven yards. Flowers also had the initial coverage on a 43-yard TD by Sanders on a crossing route, but Carroll inferred that was more of a team-wide breakdown in coverage as Seattle appeared in a zone. Flowers finished with a team-high eight tackles, five of which came on running plays. Pro Football Focus assessed that Flowers was targeted nine times and allowed seven receptions for 124 yards, one for a TD and five first downs. WHAT I SAID: Will Earl Thomas play, and if so, how much? WHAT HAPPENED: There was never really a doubt that Thomas would play, the only question was how much since he had only three practices heading into the game. Ultimately, he played quite a bit, officially 64 of 74 snaps. Denver scored a touchdown on the one possession he missed entirely and the other on which he missed the first three plays, Denver gaining 41 yards. Denver had only one other TD drive in the game. Expect Thomas to again be full-time going forward. WHAT I ALSO COULD HAVE SAID: How will the tailback snaps unfold? This was another of the game’s big curiosities, how Seattle would divvy up the snaps between Chris Carson and Rashaad Penny. Ultimately, each got 25 of the 57 snaps the Seahawks had. C.J. Prosise got the other seven at tailback. Carroll said later that the altitude (more on that in a minute) played a role in decisions to rotate players evenly at certain positions, and specifically cited tailback. Each also got seven carries, but with vastly differing results — Carson gaining 51 yards and Penny eight. Carson had an amazing hurdle on a 24-yard run but also lost a fumble on a rather otherworldly play by Von Miller. (Yet, that’s still something he’s got to try to prevent.) And while Penny did little in the running game, he had a team-high four receptions for 35 yards, one a 15-yarder that helped set up a Seattle touchdown in the third quarter. WHAT I SAID: Denver’s altitude. WHAT HAPPENED: Carroll admitted on his radio show Monday he thought some players felt the impact of Denver’s 5,280 feet elevation though he also said he couldn’t really say it if impacted anyone’s performance. The altitude can’t be blamed for missed assignments and some of what ailed the defense. And interestingly, the defense seemed to play better through much of the second half, and especially against the run — when you’d imagine altitude would take its greatest toll — until the final drive. WHAT I ALSO COULD HAVE SAID: All that youth on the Seattle roster. It was no secret the Seahawks would have to rely on a lot of young players and that there would be a learning curve. The first half in particular, illustrated clearly that the Seahawks remain a work in progress, one that may have only gotten younger on Sunday with a knee injury to Doug Baldwin, who may be out up to a month. WHAT I SAID: Third-year running back C.J. Prosise. WHAT I ALSO COULD HAVE SAID: TE Will Dissly. The former UW tight end instead was the under-the-radar player who surprised with three receptions for 105 yards, the first tight end to have 100 yards or more receiving in his first game since Bob Trumpy in 1968. Trumpy went on to catch 298 passes for 4,600 yards in a 10-year career. WHAT I SAID: The Seahawks are 4-4 in opening games under Pete Carroll and 0-2 in their last two road openers. WHAT HAPPENED: Make that 4-5 and 0-3, as Denver won its seventh-straight home opener. Seattle has not won a road opener since 2013. Yep, it was a tough place to play and the Seahawks simply made too many mistakes on a day when the margin of error figured to be slim. WHAT I ALSO COULD HAVE SAID: Run-pass ratio. Carroll has said repeatedly the Seahawks want to get back to running the ball better this season to take some pressure off the passing game. It didn’t happen Sunday as Seattle had 39 pass plays to just 16 runs, fewer rushes than in any game last season (the last time they had fewer was in a Monday night game against Buffalo in 2016). The Seahawks simply can’t survive that way and especially if leading receiver Doug Baldwin is out for any length of time, as could be the case after he was diagnosed with a Grade 2 tear of his MCL on Monday. WHAT I SAID: Linebacker Shaquem Griffin. WHAT HAPPENED: Griffin has been the feel good story of the Seahawks season, overcoming having one hand to make it to the NFL and start alongside his brother, Shaquill, on the Seattle defense on Sunday, and playing weakside linebacker in place of injured veteran K.J. Wright. But his performance Sunday was uneven — which was certainly not unexpected for a rookie also playing his first game at a new position. After Griffin played on all downs early in the game, beginning in the second quarter, the Seahawks replaced him on first and second down with Austin Calitro, and had Griffin come in mostly on third downs. With Wright needing a “miraculous’’ recovery to play this week, in Carroll’s words on ESPN 710 Seattle on Monday, expect the Calitro/Griffin tandem to likely continue this week. According to PFF, Griffin was targeted five times and allowed four receptions for 81 yards, three first downs and a TD (the eary 29-yarder to Phillip Lindsay). WHAT I COULD ALSO HAVE SAID: Brandon Marshall. The 34-year-old does indeed appear to have some juice left, with three receptions on six targets for 46 yards and a touchdown, playing 37 of 57 snaps. The Seahawks may need to lean on Marshall even more with Baldwin out. 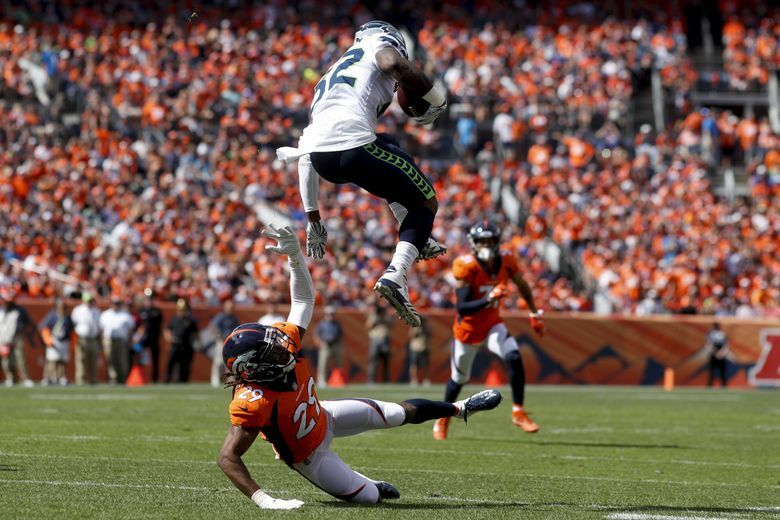 WHAT I SAID: Seahawks, 23, Broncos 21. WHAT HAPPENED: Well, the Seahawks indeed could have won it. But the three Case Keenum interceptions may have made the score closer than the game appeared considering some of the stats, such as Denver holding a 470-306 edge in yards. Seattle had been 24-3 under Carroll when forcing three or more turnovers. The running game. Seattle simply has to get that fixed. The six sacks. Some indeed were on Wilson for not getting rid of the ball more quickly, but the line also gave up too much pressure and now has to worry about new Chicago Bear Khalil Mack. The pass rush. While Denver got six sacks, Seattle got just five quarterback hits on Keenum. True, he got rid of the ball quickly a lot of times. But there were occasions he had plenty of time to do what he wanted. Frank Clark, who said afterward he remains less than 100 percent after missing much of training camp following hand surgery, had Seattle’s only sack but will need to get more consistent. And the Seahawks will hope that Dion Jordan — limited to 15 snaps in his first action after missing the preseason with a stress issue in his leg — can contribute more soon. Seattle also hopes to get more out of third-round pick Rasheem Green, who had no pressures and one tackle on a running play in 46 snaps. Finally, do the Seahawks again have a kicking issue? In a three-point game, Sebastian Janikowski’s miss stung and brought back bad memories of last season. Considering Janikowski’s age (40), missing all of last season with a back injury and that he also missed two PATs in the preseason finale, a little skepticism is understandable.